American tourist Shari Weise was walking along the popular Las Ramblas boulevard in Barcelona on Thursday when she suddenly heard the sound of banging metal. A white van was mowing down pedestrians, and Weise saw "bodies fly up into the air" and a sea of people fleeing for their lives, she told ABC News' David Muir in an interview Friday on "Good Morning America." Weise was about to jump out of the vehicle's deadly path when she saw a teenage boy standing "like a deer in the headlights." "He just froze, and I could tell in his face he didn't know what to do," Weise said. "I pulled him with me, and we crouched down together on the ground." Another witness, Brendon Sissing, who was also on Las Ramblas at that time, told ABC News he heard some commotion before turning to see a vehicle barreling through the crowd. "I heard screams of people to my left and when I looked up saw the white van, and it must have been doing 80 to 100 kilometers [about 50 to 60 miles] an hour down a pedestrian walkway, and just knocking people over at high speed," Sissing said in an interview soon after the attack. "I heard the loud hum of like an engine. It sounded like the driver was flooring it. Basically before I saw the van, I heard it," Shirazinia said. "And then I saw this white van, looked like a utility vehicle, kind of going as fast as it could down the promenade in a zigzag motion, basically aiming for whatever that was in its path. I just saw it plow into everyone." "It was like being an extra in a Hollywood movie, except it was real," he said. "When I witnessed the aftermath, then it sunk in ... I'll never forget some of the images." 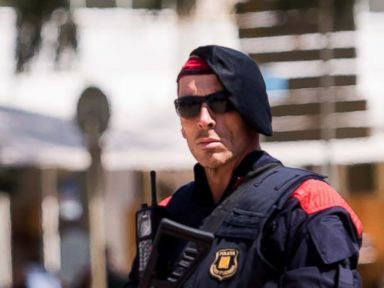 At least 13 people were killed and more than 100 were injured in the Barcelona vehicle rampage, according to Spanish authorities. Weise, a 54-year-old mother from California who was in the city with her brother, said she didn't have much time to think when she saw the vehicle racing toward her. "There's a car coming at me, there's people everywhere. I almost didn't have time for emotion," she said in the interview on "GMA." "All I thought about was, 'I don't want to get killed, I have kids, I have to get out of the way.'" Weise said she decided to cut short her European vacation and return home following the attack. ABC News' Will Gretsky and Jason Volack contributed to this report.